This is a series of news reports and features about the BP oil spill commissioned by KRVS-FM in Lafayette, LA. It is part of the larger GulfWatch local reporting initiative funded by the Corporation for Public Broadcasting and managed by Louisiana Public Broadcasting. For more information on GulfWatch you can go to this link: http://www.publicmediaexchange.org/. Most of these pieces are between six and twelve minutes long. 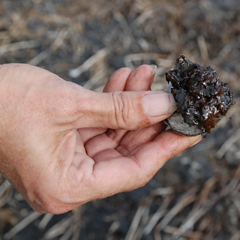 This allows the producers to get away from the usual soundbites and put the impacts of the BP oil spill in a broader context--examining, for example, the underlying issue of widespread land loss, which has made the bayous much more vulnerable to oil spills. The producers are also interested in giving voice to indigenous peoples (the Houma, Atakapa-Ishak, and Pointe-au-Chien nations) as well as Creole, Cajun, and Vietnamese-American people, who have long been settled in the bayous of South Louisiana, and looking at the impact of the oil spill on their communities.